Masahiko Tanaka - Portrait of a Master. By John Cheetham. Dave Craydon & Chris Beckles - English Internationals. Sensei Masao Kawasoe. (Part Two) Interview By Dave Hooper. A day at the Sumo. By Danny Connor. Shoto-Ryu Karate-Do. By Graham Parkhouse. 'Kata' The kumite library. By Steve Hyland. Japanese-Western Instructors - The Cultural Gap. By Lisa Schambach. Kodokai visit Japan. Report By Graham Austin. AT LAST! 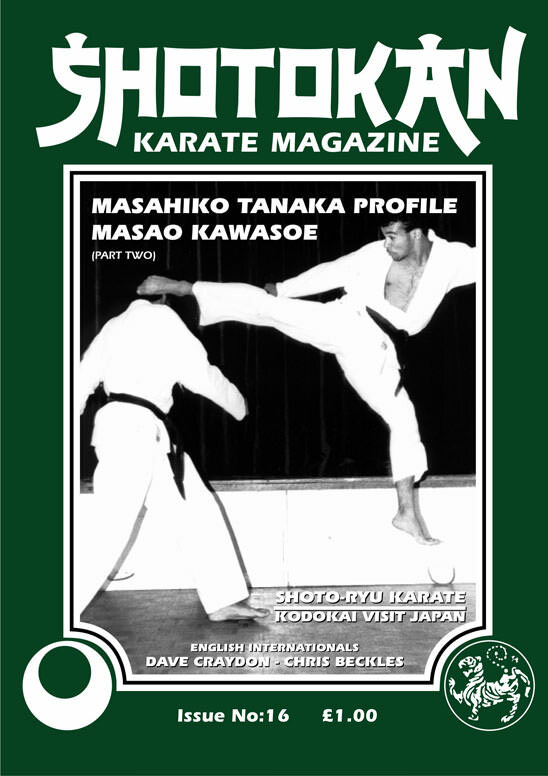 the part two interview with Sensei Masao Kawasoe appears in this the sixteenth issue of S.K.M. Only two issues late but well worth the wait. Also in this issue is Dave Hooper's reply to the K.U.G.B. 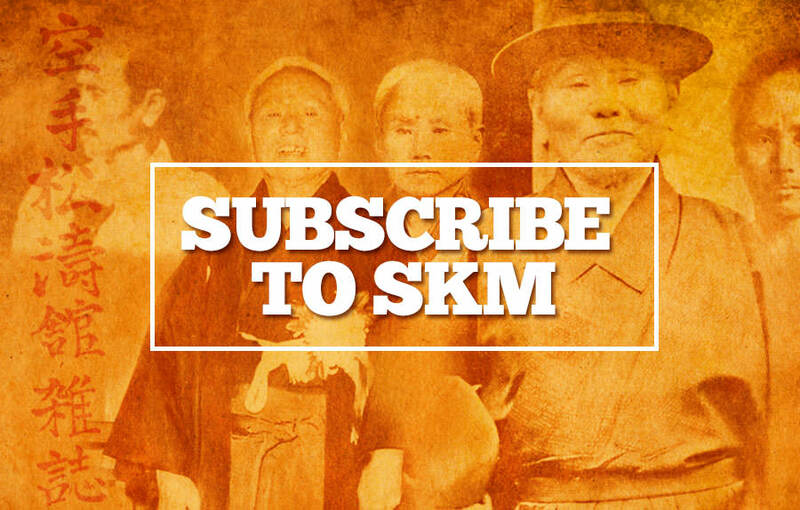 's response to Dave's controversial article 'The Way vs The Cul de Sac' which first appeared in S.K.M. issue No 14. Dave and I consented to the article being repeated in F.A.I. magazine. Poor old Dave has taken some 'stick' over that article. It's a shame really because he is one of the most sincere karateka I have come across. He simply wants Shotokan basic - fundamental techniques to remain the same way that they are taught at the home of Shotokan Karate, the J.K.A. Two young fighters get their chance to air their views, Dave Crayden and Chris Beckles are both members of Ticky Donovan's English and International squads and both are from the same Shotokan club in Liverpool. A lot of criticism has been aimed at today's young fighters, so it is interesting to see how Dave and Chris respond. I find most serious Shotokan students don't give a 'monkey's' which association any one belongs to as long as they are involved in Karate-do training. My magazine will continue to feature people from 'ALL' the Shotokan groups large and small, it's all Shotokan karate to me, and to most other people also. What is the difference between 'SHOTOKAN and SHOTOKAI', is a question I'm often asked, so chairman of Shoto-Ryu, Sensei Viv Nash, formally SHOTOKAI under Sensei Harada, has kindly sent an article dealing with this subject plus a brief history of SHOTOKAI. I'm sure that many Shotokan students will be reading this issue whilst recovering from a session on one of the many courses available this summer e.g. The J.K.A. course in Edinburgh, the K.U.G.B. course in Lancaster or Sensei Shiro Asano's S.K.I. summer school at Nottingham University or your own club or association summer camp etc., so sit back, rest those weary bones and aching muscles and have a read, maybe ease the pain with some liquid anaesthetic later on in the evening, and then back to training tomorrow!